The late summer harvest season has been wonderfully satisfying in its very humble way on our little patch of volcanic soil at Lubriano. Apart from the tomatoes and (Lebanese) cucumbers, we have had blooming amethyst like plums and our own crop of hazelnuts from the tree that rose from the shrubby bush inherited three years ago. There have been trips to collect blackberries and baskets full of green figs. It has all been quite bountiful. My grandfather Adams had a much loved fig tree in his garden and I remember loving the smell of the leaves and the shape of the branches for climbing. Surely one of the most sumptuous fruits, but one that needs to be eaten at that just perfect point, which is where gorging them straight from the tree comes in. A quasi spiritual symbol of abundance and a source of idyllic shade, a fig tree is an almost essential feature of Mediterranean gardens and orchards. 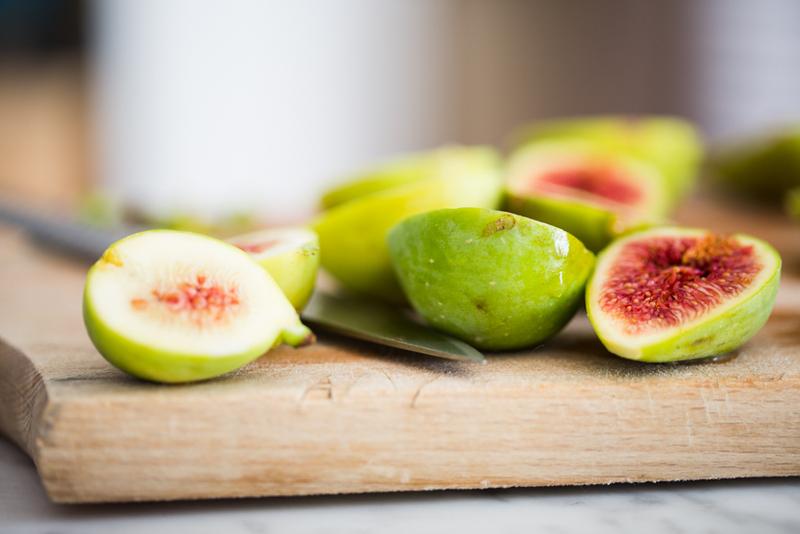 Historically fascinating because they are believed to be the oldest domesticated crop – remains dating back 11,000 years having been found around Jericho – figs were brought into Europe by the Romans. Whilst they grow well in all temperate climates the very Mediterranean nature of this wonderful tree is a reminder of the ties that bind the peoples around their shared sea. Necessity is the mother of culinary invention, otherwise known as cooking with what you have. With trays of hazelnuts out in the sun to dry and plates full of ripe figs on the table I thought for a long time about what to bake. I looked at Italian recipes celebrating these two late summer / autumn ingredients. A hazelnut crust tart with marscapone and fig filling perhaps? A cake, maybe using the recipe recently shared by my cook on the other side of the world friend Vanessa using hazelnuts and oranges, inverting the season and the fruit. 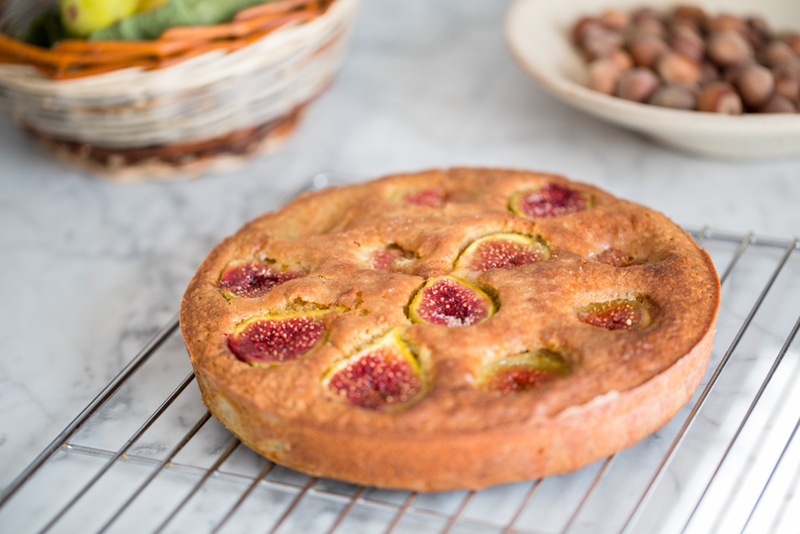 In the end I worked from my flourless cake recipe and baked the fresh figs into it, letting the cooking process release crimson juices of the fruit. 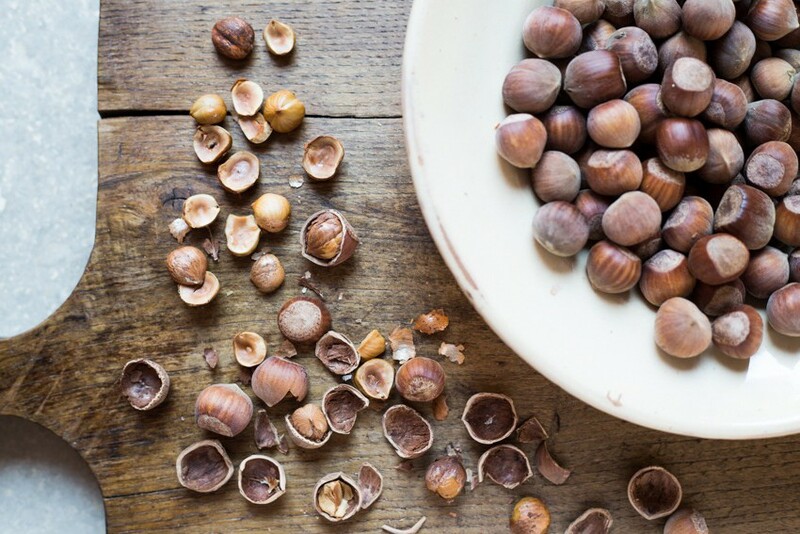 If you are working with whole hazelnuts they need to be dried (if fresh picked) shelled and toasted and then ground into a fine but not too fine meal. To remove the inner skins after they have been toasted place the hazelnuts in a clean tea towel and rub the skins off. Separate the eggs and using a hand held mixer or kitchen aid beat the whites till stiff peaks form and set aside. Cream the butter and sugar and then add the lemon zest and egg yolks and mix well. Fold in the hazelnut meal, then the stiff egg whites gently. Spoon the batter into a buttered and paper lined cake pan (20-22cm). 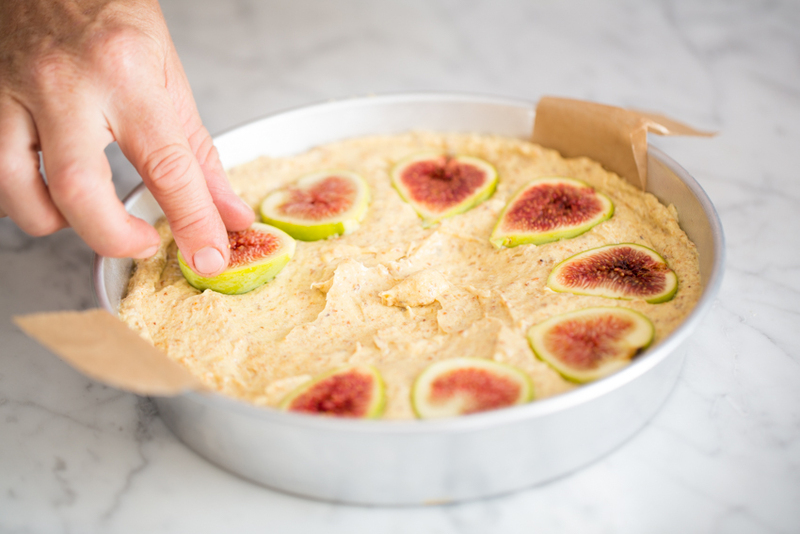 Cut the figs and arrange them around the top of the cake, gently pressing them into the mixture. Bake at 180°C for approx 25 minutes.